Despite its name, it does not come from the Netherlands, the Dutch Kazoo fuzz is hand built in the USA. Its design is not a copy of any well known Fuzz pedal which is quite noteworthy in a market saturated by Fuzz face clones. It does appear to have some interesting and original sonic capabilities. If you are just getting into Fuzz pedals, chances are that the first choice that you will have to make is: Germanium or Silicon? This refers to the transistor type inside the fuzz, or rather the material used by the pair of transistors responsible for distorting the signal. Germanium transistors were used in the early generation of Fuzz Face pedals (mid 60s) but they were prone to temperature changes. More stable, Silicon transistors became more frequently used at a later stage. It is hard to write about Fuzz pedals without writing about Jimi Hendrix aka the grand fuzz meister. He used Germanium fuzz pedals on his early albums (think Axis bold as Love) whereas on later albums such as “Band of Gypsys”, he is thought of having switched to Silicon. Of course, this is not absolutely certain as he probably used whatever he would get his hands on but this is a generally accepted fact. When Steve from Buffalo FX offered me to compare his new Germanium model with his Silicon model, I jumped at the opportunity and you can hear the results in the video below (my insights after the video). Note that I chose to record the pedals through a very clean amp in order to more plainly showcase the differences. A lot of guitarists use Fuzz pedals against an already overdriven amp which is a different thing altogether. First let’s precise that Steve’s pedals are made to high standards using quality components. As such they represent the best of the boutique world. They also sport more settings than the good old 2 knob Fuzz face, these knobs being Fuzz and Level for those of you who wouldn’t know. The Buffalo FX Silicon model features a third button named “Shape” which allows to tweak the bottom end. The Germanium model features a bias knob as well as a pregain knob. The pregain allows to tweak the amount of signal sent to the fuzz circuit whereas the bias changes the voltage, it can be used to change the tone but also to cater to temperature differences. It is generally accepted that Germanium based Fuzz pedals have a “rounder” tone, less crisp than Silicon models. And I must say that this holds true with the Buffalo FX pedals. It is especially noticeable with single coil pickups, I found it a bit less flagrant with humbuckers. I also find that the Silicon model has slightly more gain on tap. It offers a tad more sustain with my Strat but it made the volume roll off cleanup a bit less smooth than the Germanium model. I would say that if you are looking for an edgy, quite gainy Fuzz, Silicon is probably for you. But if you are looking for a warmer, bluesier even, Fuzz pedal, then Germanium might be a better match. 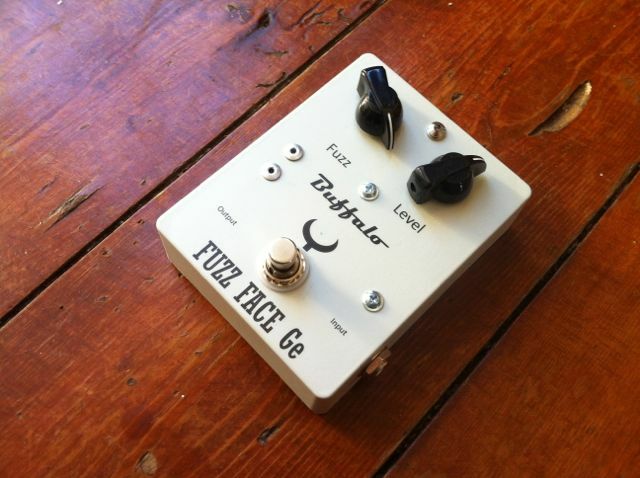 The Buffalo FX Germanium Fuzz V2 is now available. It has improved features over the already excellent V1, including controls for pre-gain and bias (click here for my review/demo of the V1) and I am pleased to announce I will demo it soon. Also on the cards, a comparison with Buffalo FX’s own Silicon Fuzz. So for those of you who’ve always wanted to see a head to head comparison between Germanium and Silicon Fuzz pedals, watch this space!